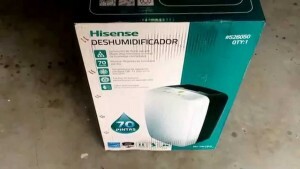 Hisense - DH-70KP1SDLE: Dehumidifier Review • The Air Geeks, reviews of air conditioners, dehumidifiers and air purifiers. 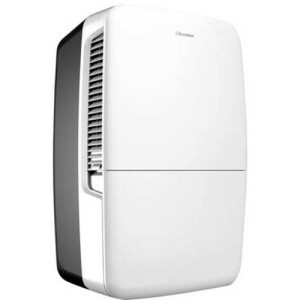 If you are tired of living in a musty space and you are looking for a high capacity dehumidifier, then you need to consider the DH-70KP1SDLE. This powerful unit is capable of pulling a lot of moisture from the air within a short time. In addition, it offers many impressive features that make it easy for users to adjust the relative humidity of their houses with ease and convenience. This unit is suitable for medium and relatively large rooms. Considering that you could be looking for a suitable dehumidifier for your room, we have gathered all the information that you need to know about this unit. We hope that this information will help you to decide whether this is the dehumidifier that you are looking for or not. We will let you know its features, strengths, and drawbacks that our tests revealed. Follow the Geeks! The DH-70KP1SDLE is a powerful dehumidifier that is designed to draw up to 70 pints of water from the air in 24 hours. Its strength makes it a suitable choice for rooms that are as large as 1500 square feet. At this rate, the unit is capable of drawing a lot of moisture to leave your room dry and free from mold, mildew, and bad smell. In addition, it regulates moisture within the desired levels to prevent higher levels that can damage your furniture, walls, and decorations to mention a few. Like most dehumidifiers, the DH-70KP1SDLE has a water reservoir for storing the captured water. In addition, it features a full bucket indicator to notify the user when the tank is full. If the user is not available to empty the tank immediately, the system shuts off automatically. This prevents the unit from flooding your floor. Most dehumidifiers use gravity to drain the collected water. Such humidity control systems are not suitable for most basements. To ensure that the collected water is effectively pumped to an external sink, the DH-70KP1SDLE features a built-in pump. In addition, the system uses a standard hose. Different users have different needs depending on their environments and personal preferences. This unit offers different operation modes to cater for the unique needs of different users. 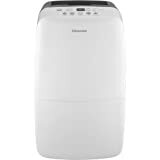 The three modes- continuous, manual set, and auto dry- make this dehumidifier a versatile choice. At the Air Geeks of course, we like it manual, but it is nice to know that this humidity control system offers an adjustable humidistat and a 24-hour on/off timer. What happens when the system achieves the desired humidity level? Good question, dear reader. To save energy, the unit shuts off automatically but continues to monitor the relatively humidity. We have observed that this unit has high sensitivity and this causes it to switch rapidly between on and off. To prevent this, some users employ an external humidity sensor to drive the unit. It is common for dehumidifiers to dissipate heat. Although the DH-70KP1SDLE produces some heat, it does not produce much of it. If it is left running for a long time, it can cause the temperature of the room to rise by a few degrees. For cold environments, this cannot be a problem. However, for users in hot environments, this slight increase in temperature may be undesirable. Like most appliances that have a compressor and a fan, this dehumidifier produces some sound. If the unit is placed in the basement, the sound may not be a problem. However, if it is positioned in the bedroom or living room, the relatively loud sound can be disturbing. Yet, as geeks, we should note that this is the case for almost all dehumidifiers. Highly effective pumping mechanism. The unit is capable of pumping water from basements and other rooms where gravity cannot be relied upon. Effective dehumidification. It lowers the moisture level of a room within a short time. This ensures that the environment of your room remains clean and fresh. Produces loud sound. This dehumidifier produces a loud sound that can be disturbing if it is placed in a quiet place. Highly sensitive humidity sensor. After achieving the desired relative humidity level, the unit shuts off and start within seconds. Such rapid switches between on and off can affect the compressor. My son received his dorm assignment last summer and went online to check it out. IT HAS ITS OWN COUGH! (I kid you not! Google Kellum Hall FSU and read all about it!) I immediately began researching ways to make his year livable. This machine has run constantly since the middle of August (it's almost Thanksgiving) and has had water dripping into the sink since the first day it was plugged in. Constantly. 24/7. The built-in pump with hose attachment (It comes with its own, so don't fall for Amazon's "you need a $7.00 hose" campaign, because you don't) is secured to the side of their dorm room sink with a piece of duct tape. The end of the tube has a slight pink tint - some form of mold, I'm assuming - but that's nothing compared to what's growing on the clothes of his dorm mates. Seriously, haz-mat teams frequent this place, but my son is breathing better in this room than he breathed at home. No morning gunky-nose, no mold issues, life is good in their little islet." Pump worked for about a month and now the unit shuts off when the bucket is full. The pump is supposed to stop the hassle of emptying the bucket. Hisense told me to contact Amazon to return the unit but Amazon won't accept a return. Hisense will now not return my queries." Having evaluated the performance of this dehumidifier, we cannot be wrong to say that it is a powerful system that offers impressive features. Its built-in pump makes it a suitable system for spaces where gravity cannot be relied upon. In addition, its capacity to draw a lot of moisture within a short time makes it a good choice for large spaces such as basements. From our research, we have observed that this unit produces a significant amount of heat that can cause the temperature of a room to rise by a few units. Furthermore, its produces loud sound that can be disturbing if the unit is positioned in a quiet environment. If these drawbacks are not a big problem to you, then this dehumidifier may be a good solution to your dehumidification needs. For us, this is so-so.